I hate on the NHL for screwing up...well, basically and literally EVERYTHING about the league...but the structure and format of the playoffs yields optimum results far more often than we, as fans and Bettman haters, want to acknowledge. 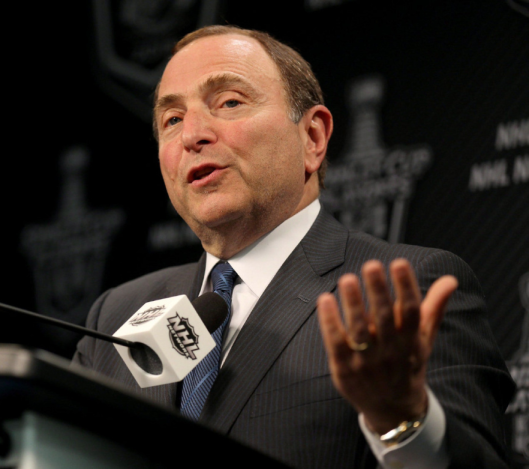 "Since I have already awarded ice hockey franchises to two deserts, the next expansion team is on the Moon." Yes, yes, I'm very well aware of the utter TRAGEDY that is the Penguins & Capitals playing in the second round, but that complaint annoys the hell out of me for the following reason: since 2008, the Eastern Conference's Pittsburgh Penguins and the Western Conference's Chicago Blackhawks have played in 7 of the 10 Stanley Cup Finals, but have never faced each other. Let me say that again: the two NHL teams with the most playoff success over the past decade– and c'mon, shut up LA Kings fans– have never met in the playoffs, but the Penguins have faced the Washington Capitals twice, and both times delivered with a Game 7. Yes, okay, the Chicago Blackhawks have actually won 3 Stanley Cups while the Washington Capitals hang up banners for winning a single regular season game, but putting aside their entire franchise worth of post-season failures, the Capitals have probably been the legitimate best team in the NHL at least 3 times in the past 10 years but YOU CAN'T SPELL "OVECHKIN" WITHOUT "CHOKE." So while the premise of a Penguins vs Blackhawks/Crosby vs Toews/Kane vs Pittsburgh Driverless UBER cars series is amazing, it's unlikely to ever happen, so instead we're treated to thrills like the Penguins playing the San Jose Sharks and Nashville Predators. The problem with the Penguins vs Sharks/Predators matchups is that Pittsburgh hockey fans would probably be rooting for the Sharks and/or Predators in the Stanley Cup Finals had both teams not been playing the hometown Pens. There's no HATE factor, just a "We want the Penguins to win" angle. With the Columbus Blue Jackets, Penguins fans could hate an entitled fan base of a franchise that hasn't won enough post-season games to advance past Round 1, let alone win a freaking Stanley Cup. 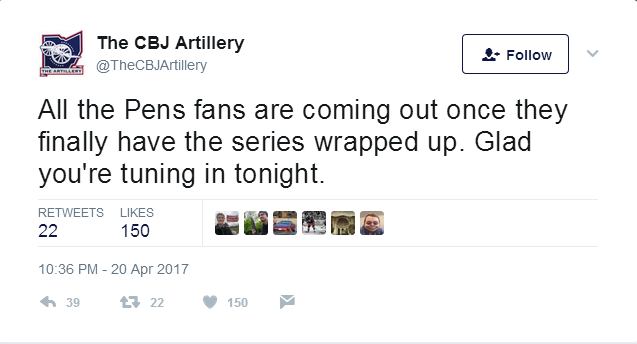 Never forget the Pens fan on your Zamboni. 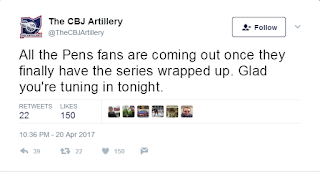 With the Washington Capitals, Penguins fans could hate an entitled fan base– hey, sounds familiar!– with a reckless Captain that has never won a single team championship, let alone a second round series. And oh yeah, the Capitals' most visible and vocal fan is Mia Khalifa. 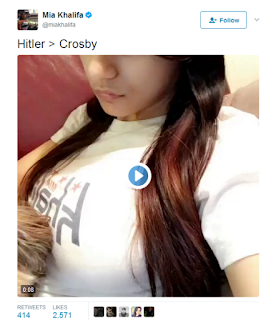 She legitimately thought that this tweet was a clever, good idea. With the Ottawa Senators, Penguins fans could hate an entitled owner in Eugene Melnyk, hate Ottawa's Captain, Erik Karlsson, for the way that he mocked Sidney Crosby communicating with his teammates, and hate Dion Phaneuf for being Dion Phaneuf. But with the San Jose Sharks and Nashville Predators....both teams were/are first-time attendees to the Finals Ball...both teams had/have rosters chock-full of players that have never won the Cup...and both teams had/have deliriously happy and genuinely excited fans. I have never cared for the chippy (see: dirty) game that Subban plays, but I became a Subban fan after the Boston Bruins' fans hurled racial epithets at him, because screw those Bruins' fans and screw that franchise. Seeing Subban personally deliver the death blows to Boston during that series remains one of the most gratifying sports moments I have ever watched. I'm a huge fan of Pekka Rinne, and the fact that the Nashville Predators were previously helmed by the now-coach of the Washington Capitals, Barry Trotz, is just delicious, yummy HAHA irony. 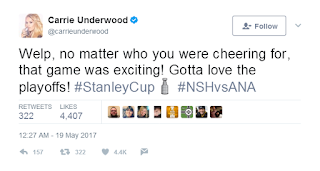 Nashville's most visible fan is the wife of Predators Captain Mike Fisher, Carrie Underwood. Her appearances and enthusiasm and social media presence regarding the game is positive and a polar opposite to that of Mia Khalifa, so again, there's no reason to get the adrenaline firing. AHA! Carrie Underwood was...humble and polite? Geez, that's no fun. I'm sure animosity will build over the next few days and games, but for now, it's a feel-good moment for both fan bases as we wait for the puck to drop on Monday night. ...oh, and as we wait for the inevitable James Neal knee to someone's head.